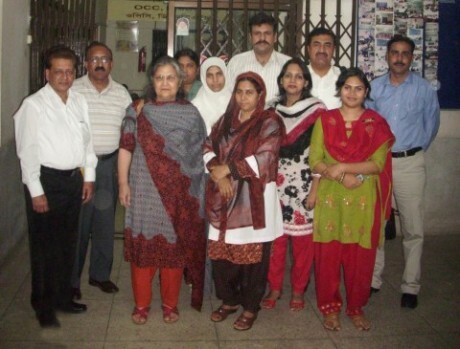 Zubaida Noor (third from left) brought members from various government departments in Khyber Pakhtunkhwa to visit a one-stop crisis centre for women in Bangladesh. Towards the end of March I travelled to Bangladesh to visit a one-stop crisis centre focusing on violence against women. Members of the Pakistani government and health department came with me, along with a group of police. We learnt a lot. It took me almost a year to arrange this visit. First I got in touch with the Women’s Affairs Department, which is a part of the Women’s Ministry of Bangladesh. Then we had to wait to get the invitation from there. They have a very good system – they have combined different sectors to set up this crisis centre. The government is in the loop and the NGO community is very vibrant. There is a lot of inter-departmental coordination between the health sector and police departments. I took along a team of eight – two of us from my NGO, the Noor Educational Trust and the other six from various government departments in Khyber Pakthunkhwa such as the health department, police sector and public prosecutor’s office. In Bangladesh they have very strict laws. They have passed a bill against domestic violence and they have strict laws against child marriages. The girl has to be at least 18 years old and the boy 21 to marry there. In Pakistan, a similar bill against domestic violence has lapsed – it was passed by the parliament but then the senate put it in cold storage. It is just not a priority for them I guess. The one-stop crisis centre is housed in a medical college in Dhaka, which is easily accessible. There is an eight-bed dormitory at the centre. Around the clock, the victims have access to doctors, lawyers and police personnel. There is even an excellent DNA lab run by scientists, which works independently and does not work under the police. After the medical examination, DNA samples can be sent to the lab for checking. In Pakistan, we have to run from one place to another to get all this done for the victims. Aside from this one-stop centre, in Bangladesh they have special cells to deal with violence against women at the district level. These cells are housed in the government’s Social Welfare Departments. Here, victims are given access to lawyers and police inspectors. In Bangladesh, often distances are large and you have to take ferries to cross the river to get to the main towns, so it is helpful to have these services at a district level. In Dhaka, under their police reforms project, they have also set up a special victim support centre in the police department run by policewomen. This project was funded by the UNDP and the motivation behind it was that women who go to the police often don’t get adequate help. So in the main Dhaka Police Station, there is a special centre where all the personnel are police women. We also visited this centre. The policewomen, all wearing their uniforms, run this center and it is supported by the Home Department. No NGOs are involved in this. In Bangladesh, the government is taking its responsibilities seriously. NGOs are involved but the government structure is working. I was very impressed by their vision and the systematic manner in which they are running things. We have come back with a lot of enthusiasm to change things at home in Pakistan. One of our group members wants to establish a DNA lab in the forensics department in Peshawar University. He learnt a lot from this trip and is very happy he got the opportunity to visit the DNA lab in Dhaka. The doctors we took along are also keen to set up some sort of emergency unit for women victims at the hospitals. We are even thinking of approaching the government to ask them to turn the women’s police stations in Pakistan into victim’s support centers. I think this is a good idea. We are meeting again next week as a group and hope to draw up a detailed plan for what we can do together and individually. Perhaps we can start something as a pilot initiative and then transfer it to the government. We are really keen for the Health Department or the Home Department to take this up a project.